When the price of first-generation Nexus 7 tablet hit Rs 10,000 around last September, the Indian tablet market saw a major shift. Never before had such a quality device been made available at such a pocket-friendly price. Dell has recently forayed into the Android tablet segment of India with its new Venue 7 and 8 tablets. The smaller of two, Venue 7, is priced at Rs 10,999 and positioned against the first-generation Nexus 7 tablet. You can actually buy it for less than Rs 10,000 in the market. With such a competitive price tag, it is an exciting prospect for any buyer looking for a small-sized tablet without burning a hole in the pocket. 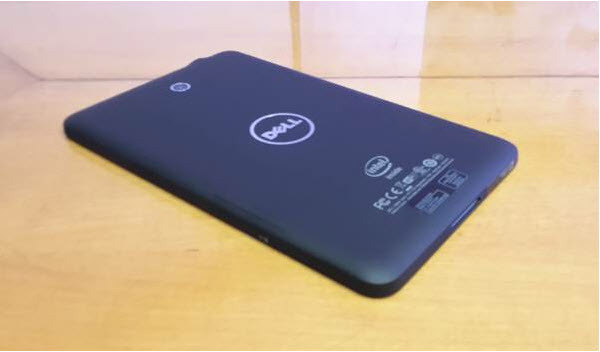 Dell has not put much effort into the design and styling of Venue 7 tablet. The slate sports a plain black coloured rear panel made of the same soft plastic material used in Nexus 7. Venue 7 is slim enough at 9.6mm, and feels very solid in the hand. You won’t hear any creaks when you test it for sturdiness. It is also compact enough to fit in the pocket of your coat or jacket comfortably. The front is, obviously, dominated by the 7-inch screen; there are no hardware buttons below the display. The Power/Lock key and Volume Rocker are made of plastic and coated with silver paint, which gives them metallic look. The outline of the rear camera and Dell logo are made using chrome. Overall, the tablet looks decent, but won’t earn nods in appreciation. Dell has put decent hardware in Venue 7 tablet: 7-inch HD screen, 1.6GHz dual-core Intel processor (with HyperThreading), 2GB RAM, Wi-Fi, 16GB internal storage, 3.15MP camera and 4,100mAh battery. The specifications are pretty decent for the price; Nexus 7 has a slightly bigger battery (4,325mAh), 1GB RAM and no rear camera. But there’s more to any device than just specifications. The 7-inch IPS screen does not do justice to colours and that remains its biggest flaw. Any image or video you view will feel lacklustre due to dismal colour reproduction by the display panel. This is the weakest point of the tablet and should have been taken care of before it hit the market. After all, a tablet is more of a content consumption device than anything else. The dual-core Intel processor used in Dell Venue 7 tablet is not the fastest around, but it does the job. It features HyperThreading technology, which essentially allows the dual-core chip to operate as a quad-core processor. However, this has not helped speed up apps in actual usage and we did not find Venue 7 to be as fast as Nexus 7. On the other hand, the 2GB RAM ensures that running apps are never out of memory. This much RAM is, in fact, a rarity at this price point, as most rivals just offer 1GB RAM. It offers you 16GB of internal storage and you can expand capacity by another 32GB via microSD card. Dell Venue 7 is a Wi-Fi-only tablet, not offering 3G support; this means it does not support voice calling as well. Dell Venue 7 runs on Android 4.2 operating system, sans any customised skin. The operating system is smooth and operates without any hiccups. Dell has preloaded its own PocketCloud and PocketCloud Explore apps on the tablet; PocketCloud gives you free cloud storage, while PocketCloud Explore allows you to remotely access data on your computer using the tablet. While the software is easy to use and smooth, we did not like the default keyboard. The typing experience is not smooth and the backspace key in particular missed several taps. Eventually we downloaded a keyboard app from Play Store and used the device for editing and writing documents. We really like that Dell has integrated the mid-range hardware with clean and simple software to deliver a decent budget tablet. However, there are a few issues that need to be sorted out. Along with sub par colour reproduction, the display panel suffers from poor viewing angles. The colours, already lacking the punch, are completely washed out when you view them from steep angles. This becomes an issue when a group of people are watching a video on the device. You will also notice some pixilation while reading, adding to the screen woes. On the other hand, the performance is pretty good. The dual-core processor and 2GB RAM work cohesively to ensure all apps run smoothly and do not give the ‘Out of Memory’ error that is so common at this price range.